$2 NLHE 6-max: AAA vs AAA, standard or overplayed by hero? did hero overplay top set on the turn or river? 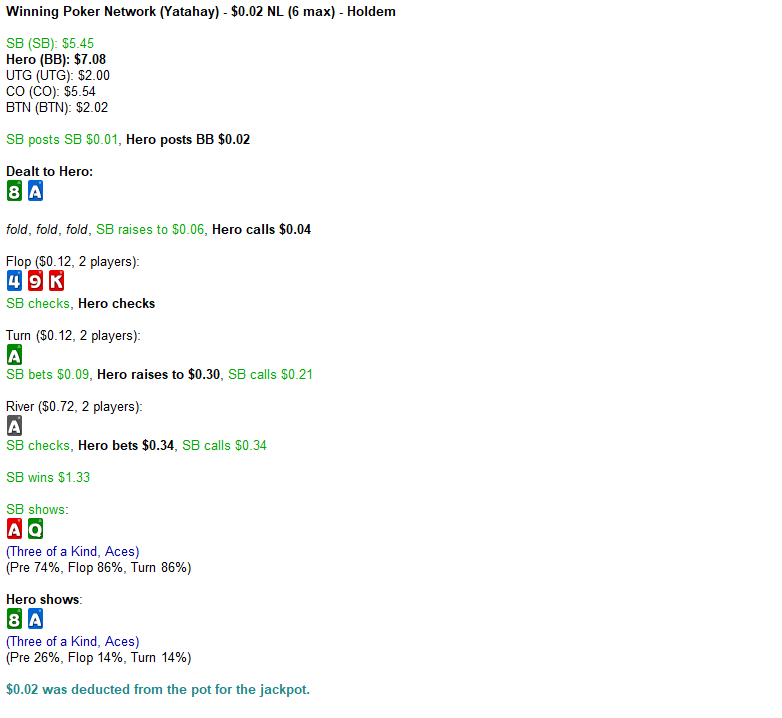 Similar Threads for: $2 NLHE 6-max: AAA vs AAA, standard or overplayed by hero? Yes, I think you overplayed your trips here. First, I don't like the pre flop call on the button. 3-bet or fold imo...mostly fold. 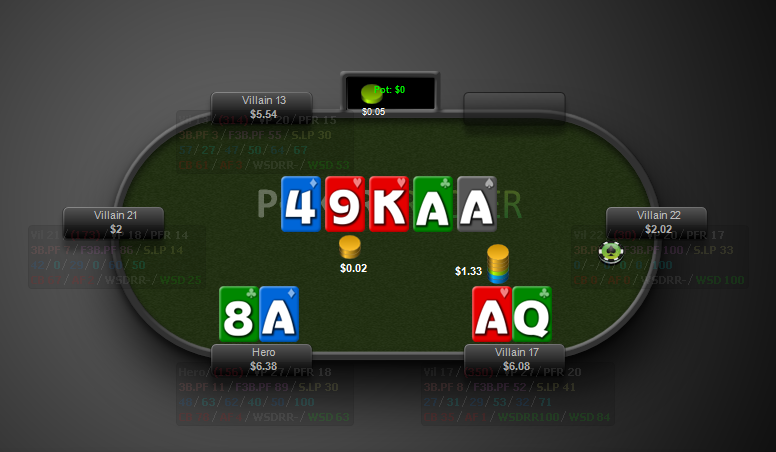 But then, when the flop goes check check, and villain bets the turn, where do you have him? I would say Ax, a flush draw, or maybe a slow played set. Just a call with A8 here for me. As played, when villain calls your raise on the turn, I think you should have villain on an ace at worse. I think you should check the river back, you have kicker problems. yeah definitely not happy i played that hand at all, after reviewing it. starting to learn a hell lot from you guys through this forum, appreciate the feedback!!!! Could bet flop but checking is also fine for me. re: Poker & $2 NLHE 6-max: AAA vs AAA, standard or overplayed by hero? if youre folding A8o pre in BvB youre burning money. this is definitely a flat call. as played turn should be a call, not a raise. not sure its worth evaluating the river though since its not really a spot you should be in. although with that board, the opponent will rarely have another A and he might not give you credit for having an A so you could get calls from his Kx when you raise the river, but since you raised the turn, this is kind of irrelevant because you basically just told him you spiked top pair on the turn so you dont get value from worse. Shud just checkback on turn and river.